Lock in a great price for Covo dei Saraceni – rated 8.6 by recent guests! The hotel is in the ideal location and has the best views in town which are breathtaking! This was our second stay and the Michelin star restaurant once again created unique and memorable lunch and dinner offerings which coupled with the spectacular setting makes this spot both a favorite hotel and restaurant for the Puglia region. Looking forward to my next stay! The breakfast room has a nice view, and the food is among what I have found to be top tier in Italy, which is to say simple, but tasty, food. The air conditioning, water pressure, and mattress were all satisfactory. Classic Italian elegance without any ostentation. Staff were wonderful. The room was clean and well appointed. Great location, five minute walk to the main part of town. Exactly what I was expecting. Location was great, and the Bastion Restaurant was very good. Nice updated rooms, but rather small. Breakfast was very good, location was great as well. We had the tower room which encompasses the entire fourth floor which actually is the roof. The view was 360° and absolutely spectacular! Everything! Location was unbeliavably perfect! We stayed in a separate building away from the main hotel and it was right near the stairs that bring you to Cala Monachile! Customer service was spot on. Room was clean, large and with an amazing view. I was a bit concerned about the reviews about this hotel but after staying here I cannot be more satisfied about my choice. We will definitely be back! Room was beautiful. Incredible views from balcony. Covo dei Saraceni This rating is a reflection of how the property compares to the industry standard when it comes to price, facilities and services available. It's based on a self-evaluation by the property. Use this rating to help choose your stay! 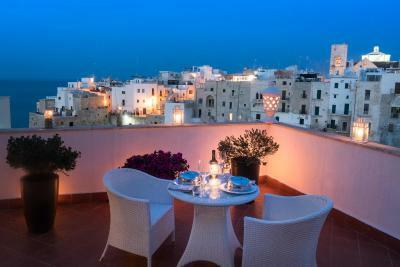 One of our top picks in Polignano a Mare.In Polignano a Mare, Covo dei Saraceni is on a panoramic cliff-top location above a pebble beach. This 4-star hotel features a traditional restaurant and air-conditioned rooms and suites. The bright rooms at the Covo feature satellite TV and a minibar. Each has a private bathroom, and some offer views of the Adriatic Sea. Some rooms and suites are in a building next door to the lobby. The Il Bastione Restaurant serves regional cuisine specializing in locally-caught fish and seafood. In summer months, guests can dine out on the terrace offering beautiful sea views. 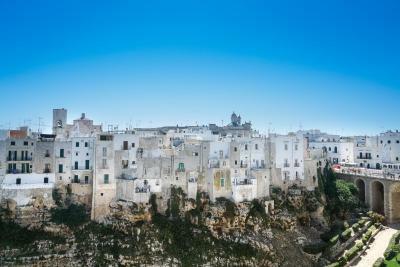 The cliff-side town of Polignano a Mare offers beautiful views and is a great location for visiting the nearby cities of Monopoli and Bari. A bike rental service is also available for exploring the local countryside. 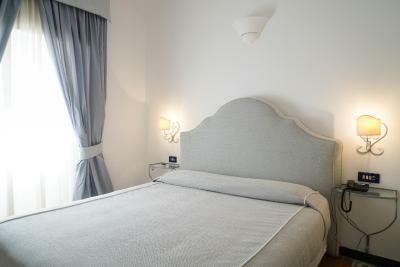 When would you like to stay at Covo dei Saraceni? 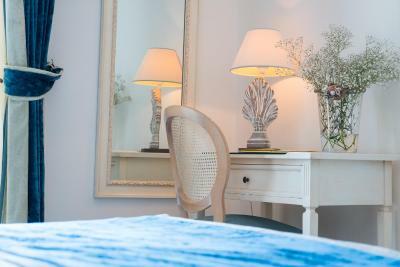 Featuring a lateral sea view, this air-conditioned room comes with a satellite flat-screen TV and a mini-bar. The bathroom includes bathrobes, free toiletries and a hairdryer. 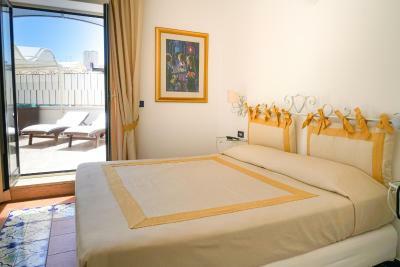 Featuring a furnished balcony, this air-conditioned room comes with a satellite flat-screen TV and a mini-bar. The bathroom includes bathrobes, free toiletries and a hairdryer. Featuring a sew view of the Bastione S. Stefano cliff, this air-conditioned room comes with a satellite flat-screen TV and a mini-bar. The bathroom includes bathrobes, free toiletries and a hairdryer. 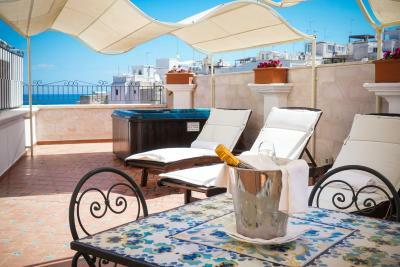 Featuring a terrace with a hot tub and a view of the Bastione S. Stefano cliff, this air-conditioned room comes with a satellite flat-screen TV and a mini-bar. The bathroom includes bathrobes, free toiletries and a hairdryer. Featuring a balcony, this air-conditioning suite comes with a modern style dècor, a satellite flat-screen TV and a mini-bar. The bathroom includes bathrobes and slippers, free toiletries and a hairdryer. Featuring a terrace, this air-conditioning suite comes with a modern style dècor, a satellite flat-screen TV and a mini-bar. The bathroom includes bathrobes and slippers, free toiletries and a hairdryer. Set 33 feet from the main building, this air-conditioned room comes with a satellite flat-screen TV and a mini-bar. The bathroom includes bathrobes, free toiletries and a hairdryer. Set 33 feet from the main building, this air-conditioned room features a sea view, a spa bath and a satellite flat-screen TV. The bathroom includes bathrobes, free toiletries and a hairdryer. Set 820 feet from the main building, this air-conditioned room comes with a satellite flat-screen TV and a mini-bar. The bathroom includes bathrobes, free toiletries and a hairdryer. Set 820 feet from the main building, this air-conditioned apartment comes with a view of the Bastione S. Stefano cliff, a fully equipped kitchen and a seating area with a satellite flat-screen TV. The bathroom includes bathrobes and slippers, free toiletries and a hairdryer. House Rules Covo dei Saraceni takes special requests – add in the next step! Covo dei Saraceni accepts these cards and reserves the right to temporarily hold an amount prior to arrival. We had reserved a room with a jacuzzi but at our arrival it was disabled. Lovely restaurant and delicious breakfast!! Hi there We checked in for one night, when going to use our room and spa bath (something extra we paid for). Nothing worked in the feature, the water also came out brown. We called receptions to ask what was wrong and were told we should leave our room for an hour or so. Not ideal before a very special meal we had booked in for 8pm for my partners birthday. We decided to go over tot he hotel and have a cocktail by the sea view whilst we had to wait, but this was not possible either. In the end my we didn't bother coming back to our room and didn't get a chance to enjoy any of the aspects of the hotel we booked it for. On checking out, no one asked how our stay was or apologised. When we asked to book a taxi for the evening we were almost told off for not doing it sooner and it all seemed a bit of trouble being there rather than a pleasant exchange and process. I found a mix with the staff, but overall, my first experience was lasting. I do not like being condescended to by anyone, but even less by hotel staff. Also, if like me, you filter for parking... buyer beware. The parking is not on site. Ultimately it is not terribly far away, but if you have to walk, there are other hotels you might consider. Also, the staff was not interested in really assisting me with getting what I wanted, so much as telling me that I couldn't have it, or that I was wrong, mistaken, etc... Well, that is not entirely fair, the young Pakistani guy is a real go getter, but the lady behind the desk was your typical Italian with a contract job... completely useless and plenty protected enough not to care. Unfortunately, I think she poorly represents her colleagues, and actively steps on their attempts to be courteous and helpful. Also, be aware, not all rooms have a sea view (Review carefully as they do make this information available when booking, but be sure BEFORE you book) Also, if your room does not have a sea view, or terrace, some al la carte in room services are not available, such as massages. I would not completely recommend against staying here, but I would advise you to do your homework before booking. Especially if you use booking.com. Once they have the excuse, they will direct you to booking for everything. The restaurant was a bit of a disappointment. Quite overpriced and the service wasn’t great either. Hotel’s WiFi was poor especially in the rooms!! Great location, close to the beach, restaurants and bars. Great breakfast!